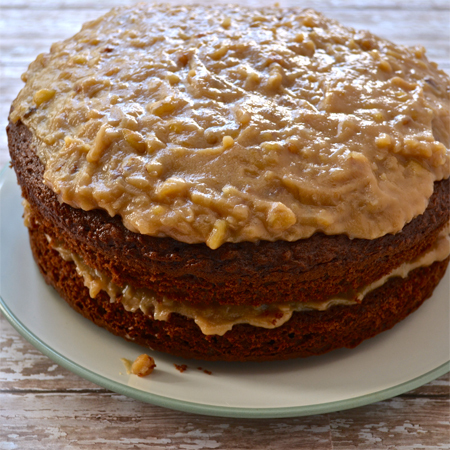 One of my favorite cakes (and my husband's) is German Chocolate Cake. I make it a couple of times a year. Once for D's birthday and once just for fun. Now, unfortunately, both times I make it will involve heartbreak over Buddy's tree nut allergy. Sad. I'll grant it that this is not an authentic german chocolate cake. I use a boxed cake mix. I do, however, think that the recipe for the frosting is pretty darn good, so I thought I'd share it. Mix all ingredients together in a medium saucepan (I like to use my non-stick sauce pan). Bring to a medium boil. Stir constantly for 5-10 minutes. Let cool. Frost one recipe of german chocolate cake.